Western blot analysis of extracts from various cell lines using ADRM1 (D9Z1U) Rabbit mAb. 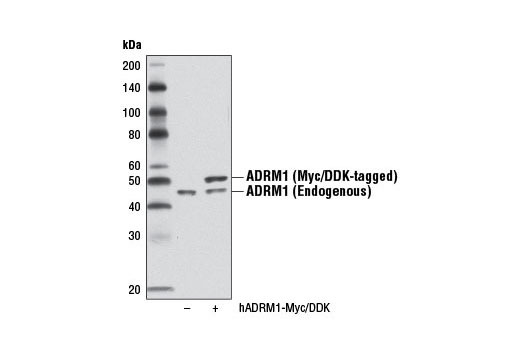 Western blot analysis of extracts from 293T cells, mock transfected (-) or transfected with a construct expressing Myc/DDK-tagged full-length human ADRM1 (hADRM1-Myc/DDK; +), using ADRM1 (D9Z1U) Rabbit mAb. Immunoprecipitation of ADRM1 from 293T cell extracts using Rabbit (DA1E) mAb IgG XP® Isotype Control #3900 (lane 2) or ADRM1 (D9Z1U) Rabbit mAb (lane 3). Lane 1 is 10% input. 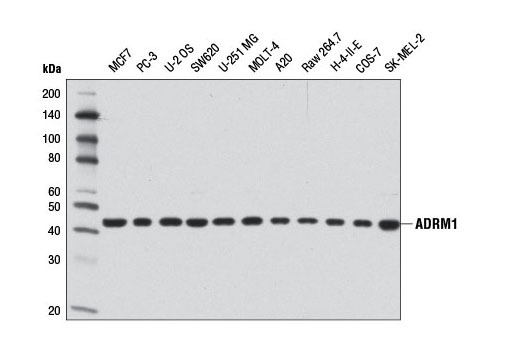 Western blot detection was performed using ADRM1 (D9Z1U) Rabbit mAb. 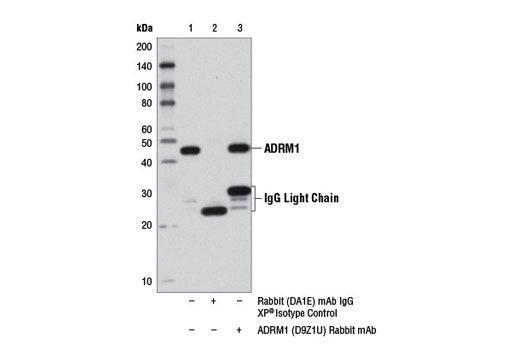 ADRM1 (D9Z1U) Rabbit mAb recognizes endogenous levels of total ADRM1 protein. Monoclonal antibody is produced by immunizing animals with a synthetic peptide corresponding to residues near the amino terminus of human ADRM1 protein. Currently, there are five ubiquitin receptors associated with the proteasome: two proteasome subunits, Rpn10/S5a/PSMD4 and Rpn13/ADRM1 (Adhesion-regulating molecule 1), and three families of shuttling factors, Rad23, Dsk2, and Ddi1. ADRM1 is a ubiquitin receptor of the proteasome (1,2) that binds ubiquitin via a pleckstrin homology domain known as the pleckstrin-like receptor for ubiquitin (Pru) domain. The carboxy-terminal domain of mammalian ADRM1 serves to bind and enhance the isopeptidase activity of UCHL5/UCH37 (3-5), perhaps serving as a mechanism to accelerate ubiquitin chain disassembly. A murine Adrm1 knockout results in defective gametogenesis, thus highlighting a physiologic role for endogenous ADRM1 in mammalian development (6). Schreiner, P. et al. (2008) Nature 453, 548-52. Husnjak, K. et al. (2008) Nature 453, 481-8. Yao, T. et al. (2006) Nat Cell Biol 8, 994-1002. Hamazaki, J. et al. (2006) EMBO J 25, 4524-36. Qiu, X.B. et al. (2006) EMBO J 25, 5742-53. Al-Shami, A. et al. (2010) PLoS One 5, e13654.